As incredible as it seems, advocates of “integrative medicine” are on the verge of creating a new specialty, emergency acupuncture. I wish I were joking, but I’m not. Sometimes there is a strange confluence of events that dictate what I feel that I need to write about when my turn here at SBM rolls around each Monday. Last week, a reader sent me a rather bizarre acupuncture study, and I thought I might write about that. Then I saw Mark Crislip’s (as usual) excellent deconstruction of the frequent claim by acupuncture apologists that acupuncture “works” by releasing endorphins and thought, “Maybe another topic.” But then, over the weekend, the Friends of Science in Medicine sent me a link to their latest article, a review of acupuncture entitled “Is there any place for acupuncture in 21st century medical practice?” Not surprisingly, the FSM (Friends of Science in Medicine, not the Flying Spaghetti Monster) concludes that the answer is no. However, in stark contrast to that conclusions are studies like the one mentioned above, studies so ridiculous that, when I discuss it, you will hardly believe that anyone thought it was a good idea to utilize the money, time, and precious, precious human subjects to answer such a ridiculous question. After that discussion, I’ll come back to the FSM’s statement and discuss the evidence base (or rather, lack thereof) for acupuncture for pretty much anything. As Mark noted, one of the most commonly invoked “explanations” (other than that it “releases adenosine“) is that acupuncture somehow stimulates the release of endorphins, natural, endogenous substances that suppress the sensation of pain. Based on dubious science, acupuncture apologists are frequently seen touting its benefits and explaining them to credulous media outlets such as Consumer Reports . Since endorphins are basically neurotransmitters (substances that transmit a chemical message from neuron to neuron or neuron to muscle) that stimulate the same receptors as morphine, namely opioid receptors, they function as a natural system to decrease the sensation of pain, among other functions. There are basically four types of endorphins: alpha (α), beta (β), gamma (γ) and sigma (σ), all of them peptides and distinguished by having different numbers and types of amino acids making up their structure. To put it simply, opioid pain relievers like morphine or Fentanyl mimic natural endorphins. There’s a lot of woo out there whose advocates invoke endorphins, basically any “complementary and alternative medicine” (CAM) that claims to reduce pain or make one feel better. Enter emergency acupuncture. No, I’m not kidding you. Instead of battlefield acupuncture, which is helping to pave the way for acupuncture to infiltrate the VA Medical Center system, here we have a clinical study examining the use of acupuncture in the emergency room, published in The American Journal of Emergency Medicine , entitled “Acupuncture versus intravenous morphine in the management of acute pain in the emergency department.” No, I kid you not. Click on the link if you don’t believe me. This is a clinical trial randomizing people with acute pain to acupuncture versus intravenous morphine. Its ClinicalTrials.gov identifier is NCT02460913. Let’s take a look at this study. It is a phase 2 clinical trial that randomizes patients in the emergency room with acute pain to either titration of intravenous morphine or acupuncture. As you can probably imagine, it is completely unblinded. There is no sham, nor is there even an attempt at blinding. Given that, I bet you can guess the result before I even describe the study in more detail, because the results of such a study are very predictable. Let’s move on, anyway. First, how do the investigators, who are based at two different hospitals in Tunisia affiliated with the University of Monastir, justify their study? First, they invoke a systematic review of acupuncture use in the emergency department, which, amazingly, found 102 studies. Not amazingly, only two RCTs and two uncontrolled observational studies were deemed eligible. Also not surprisingly, in line with the methodolatry that characterizes evidence-based medicine (EBM), the authors concluded that “current evidence is insufficient to make any recommendations concerning the use of acupuncture in the ED” and recommended that the “effectiveness and safety as well as the feasibility of acupuncture should be tested in future RCTs.” Of course, the science-based medicine (SBM) retort to this conclusion is that, given the extreme lack of prior plausibility of acupuncture, coupled with such equivocal clinical evidence, the most parsimonious explanation is that acupuncture doesn’t work. The World Health Organization (WHO) has recognized acupuncture as a safe and effective therapy for a myriad of conditions causing pain and discomfort . However, the introduction of acupuncture in the treatment of pain in the ED is rare. Acupuncture was shown to be as effective as morphine and it has a better safety profile which makes it a suitable method of pain control in certain circumstances such as headaches, migraines, back pain, cervical pain and osteoarthritis . Again, that damned WHO report. Basically, it was a report written by acupuncturists who made statements at odds with the evidence. Actually, in this case, the authors referenced a 2002 acupuncture report that appears to be an update to the original that acknowledges the “debt” to the acupuncturists who authored the original report. In any case, the rationale for using acupuncture in the emergency room is, as you would expect, quite weak. Patients were screened for inclusion in the triage unit during the day between the hours of 8 a.m. to 7 p.m., Monday through Friday. Eligible patients were those who presented for moderate to severe acute onset pain with stable clinical conditions that did not require any resuscitation measures or specific procedures except for treatment of painful condition. Patients were included in the protocol if they were aged ≥18 years and met the following criteria: Acute onset pain <72 hours of the ED presentation, pain intensity ≥40 of the VAS or NRS (ranging from 0 for no pain to 100 for maximum imaginable pain), acute musculoskeletal pain with no evidence of fracture or dislocation, including ankle and knee sprains without signs of severity (ligament rupture, laxity), shoulder and elbow tendinitis, upper and lower limb mechanical pains and lower back pain with no evidence of neurological deficit, acute abdominal pain with no urgent surgical intervention including renal colic and dysmenorrhea and acute headache that meets the criteria of primary headache, as described by the international headache society . As you will see later, these criteria lead to some real problems with the study, but I’ll forego discussion of that aspect until I get to the results in favor of pitching a TV show to Lifetime called “Emergency Acupuncturists!” Don’t worry, I’ll get back to this problem soon enough, but I will hint now that the mix of patients in each group was not comparable. I’ll also mention that if I came in with pain from a kidney stone, there’s no way in hell that I would let an acupuncturist near me or agree to be randomized. The other major problem with the study design, as I discussed before, is that it is completely unblinded. Patients, doctors, acupuncturists, everyone knew which group the patient was in. This sort of design is almost guaranteed to produce a result in which the acupuncture group shows a high degree of pain relief, thanks to placebo effects. Whether that pain relief will be more, less, or the same as the standard of care to which acupuncture is being compared varies depending on the study, but I rarely go wrong predicting that an unblinded acupuncture study will show a lot of benefit for acupuncture, sometimes even the same as or greater than standard of care. After allocation to this group, patients were redirected to the ED acupuncture unit. The acupuncturist was an ED doctor with medical acupuncture qualification accredited by the National Tunisian Council of Doctors with 10 years experience in the field. Treatment protocols were determined through review of major clinical manuals and textbooks, literature review, and a panel of specialist acupuncturists from Chinese medicine backgrounds . The protocols, which allow acupuncture points to be selected from a pool of pre-determined points for each condition, provide sufficient standardization to assist replication, yet are flexible enough to allow individualized treatments. These protocols also allow for additional points, such as ‘ashi points’, to be used at the discretion of the acupuncturist. The location of the points, angle of insertion and depth of insertion were sourced from a popular text “A Manual of Acupuncture”  and described in the annexe table (annexe1). The average time to place needles is five minutes. So basically acupuncturists could choose any points they wished. Of course, as I’ve pointed out before, acupuncture “works” (i.e., produces placebo effects) whether you put the needles into the “right” points or not. It doesn’t even matter if you actually insert the needles, as long as you touch the skin (even with toothpicks instead of needles)! Be that as it may, there was not even an attempt to include a sham acupuncture group. The morphine group involved titrating morphine, starting with a dose of 0.1 mg/kg and repeating the morphine at 0.05 mg/kg every five minutes until the desired decrease in pain was achieved, with a maximum total dose being 15 mg. This is a fairly standard ER protocol for treating acute pain, although other evidence suggests that a titration scheme using a protocol with an initial dose of 2 mg (body weight < 60 kg) or 3 mg (body weight > 60 kg) with subsequent administration of 3 mg of morphine every 5 minutes until desirable or adverse effects occurred is more effective. Be that as it may, we are basically seeing a test of acupuncture versus one widely utilized protocol for dosing morphine for acute pain. Also, patients were allowed to receive other treatments suitable to their conditions if judged necessary, such as ice application, compression, elevation and rest. It wasn’t clear to me if this was also the case with the acupuncture arm. Success rate was significantly different between the two groups (92% in the Acupuncture group vs. 78% in the Morphine group P < .01). Resolution time was 16 ± 8 minutes in the acupuncture group vs. 28 ± 14 minutes in the morphine group. The difference was statistically significant (P < .01). The mean absolute difference in pain score between the two groups was 7.7. This difference is not clinically significant since the minimal clinically significant absolute difference reported by Todd et al. is 13. In Morphine group the mean total dose of Morphine administered was 0.17 ± 0.08 mg/Kg (Table2). I’ll give the investigators credit for mentioning that a statistically significant difference does not necessarily mean a clinically significant difference in pain scores. I only wish Andrew Vickers would learn this lesson. One also notes that a titration scheme like the one above to reduce acute pain using morphine will likely take at least 20 minutes, given that it consists of administering subtherapeutic doses of morphine, assessing reduction in pain after five minutes, and then giving an even smaller dose, rinse, lather, repeat. The reason for this, of course, is that morphine can depress respiration and decreased blood pressure, which is why clinicians need to be cautious, but such an approach inherently takes longer. Excuses and incomparable (uncomparable?) groups! Now, I’ll revisit what I alluded to earlier about an uneven distribution of conditions. It’s hard not to note in Table 1 that there were significantly more abdominal pain patients in the morphine group (79) than the acupuncture group (60) and that there were significantly fewer low back pain patients (27 in the morphine group vs. 44 in the acupuncture group). Given that in general we try to avoid opioids for low back pain and that low back pain often resolves with relaxation and rest, one has to wonder if these skewed the results. Similarly, the most common condition causing abdominal pain that doesn’t require immediate surgery for which it is safe to administer opioid analgesics is likely to be kidney stones, which are extremely painful and not likely to pass quickly. Given that patients with abdominal pain were the single largest group in this trial, making up close to half the total patients, one wonders why the authors didn’t break out the pain scores for this group, given that there was such an imbalance between the groups. It also concerns me that this ER is administering morphine for so many people with abdominal pain. While that is appropriate for kidney stones, it is seldom, if ever, appropriate for dysmenorrhea (painful menses). Also, there is a big problem with the reporting of this clinical trial, so much so that I’m surprised this journal published it. There is no CONSORT flow diagram to show allocation of subjects, dropout rates, and analysis. Indeed, seeing a clinical trial in which there are exactly 150 subjects in each arm always makes my skeptical antennae start twitching. No one dropped out of the study? No one was randomized but decided not to go through with the trial? I suppose it’s possible for a short term intervention in the ER, but consider this: Accrual was exactly perfect for each group. This almost never happens in a clinical trial. First, the main flow of this trial is the lack of blinding. In fact, in these settings sham acupuncture has been proposed to provide a comparable experience to the study subjects and to minimize the effects of nonblinding. However, in our study sham acupuncture use would be impossible given the workload of a single acupuncturist. If this were a study of acupuncture for a more chronic condition, I’d incorporate some sort of crossover design, but it isn’t; so I won’t. Having these four groups would allow a complete analysis of the two interventions with far less potential for bias and placebo effects. However, in a pinch, if there aren’t resources to recruit patients for four groups like this, just including the first two groups would do nicely for a pilot project. Of course, this is an EBM standpoint. From an SBM standpoint, in which basic biology indicates a prior plausibility for acupuncture that is incredibly low, I would judge this study not worth doing, but I’d also say that if you insist on doing it anyway you should at least do it right. Unfortunately, such is the quality of the vast majority of acupuncture studies, which brings us to the FSM statement. TCM, also present in Japan, where it is called Kampo, is, together with Indian Ayurveda and pre-Enlightenment European medicine, one of the major pre-scientific medicines. They share common roots, probably from ancient Indian philosophies, according to which the equilibrium of the healthy human body is believed to be the result of a balance of a number of elements. Diseases are thought to be due to their imbalance. In TCM, these elements are wood, water, fire, earth and metal, a belief similar to that of ancient Indian Unani medicine, with its four humours (akhlaat) – air, earth, fire and water, and Indian Ayurveda medicine’s air, water and fire. Pre-scientific European (from Greco-Roman) medicine proposed four humours, each associated with the four natural universal elements (blood – air; phlegm – water; yellow bile – fire; black bile – earth). Although these theoretical constructs represented an initial attempt to unify knowledge about the world and ourselves, none has any scientific foundation. Traditional Chinese medicine is based on principles very similar to the “four humors” of ancient European medicine. So why the love for TCM and not for Hippocrates? 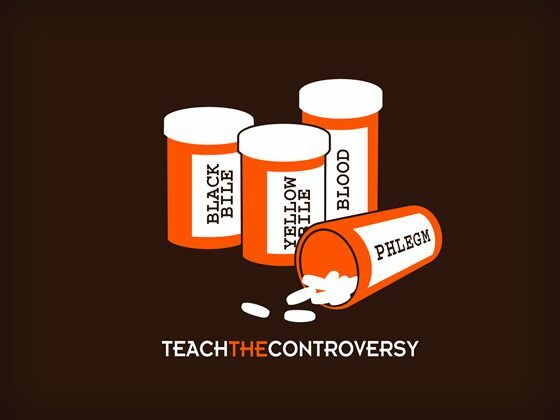 Teach the controversy! Many of the points (get it—”points,” acupuncture?) made by FSM are points familiar to regular readers of SBM. Acupuncture is not really ancient, given that early Chinese medical texts don’t mention it. It appears to have been more based on lancing abscesses with a larger lance and ancient bloodletting not unlike what was practiced in Europe, possibly with a bit of astrology added. Even as recently as 103 years ago, acupuncture was practiced in a barbaric fashion with very large needles, often heated, left in the body for days, sometimes resulting in death. Then, of course, there was the retconning of TCM by Chairman Mao Zedong, who didn’t really believe in TCM but didn’t have the resources to bring SBM to his entire country. So he tried to “integrate” TCM into modern medicine and dispatched hordes of “barefoot doctors” practicing TCM to fill in the breach. Then, starting in the 1960s and 1970s, stories of the wonders of acupuncture filtered to the West from China, thanks to credulous journalists. Then there’s the veritable catalog of proposed “mechanisms” by which acupuncture “works,” including adenosine (wrong) and endorphins (again, wrong). Add to that the variability in studies, the oft-repeated observation that it doesn’t matter where you stick the needles or even if the needles pierce the skin, and it becomes clear that acupuncture is merely “theatrical placebo.” As Steve Novella likes to point out, the better designed the study, the more likely it is to show no discernable effect attributable to acupuncture greater than placebo effects. No wonder acupuncturists like unblinded studies. Is there any justification for the use of acupuncture in modern medicine? As acupunctures loses support in Medicine, it is increasingly used as part of larger constellations of alternative treatments within private enterprises which mix together, almost randomly, any of the many pseudoscientific interventions under a generally attractive umbrella of ‘wellness’. This makes acupuncture even less reliable and hides it from public scrutiny. Acupuncture has been studied for decades and the evidence that it can provide clinical benefits continues to be weak and inconsistent. There is no longer any justification for more studies. There is already enough evidence to confidently conclude that acupuncture doesn’t work. It is merely a theatrical placebo based on pre-scientific myths. All health care providers who accept that they should base their treatments on scientific evidence whenever credible evidence is available, but who still include acupuncture as part of their health interventions, should seriously revise their practice. There is no place for acupuncture in Medicine. I, of course, agree wholeheartedly with FSM that there is no place for acupuncture in science-based medicine, but I must quibble with FSM on one point. Acupuncture, unfortunately, is not “losing support in medicine,” at least not in the US. Rather, it is, at the very least, remaining popular, if not outright gaining support; indeed, of all the quackery in CAM that is out there, acupuncture is the one with the most “respectability.” You can find it being offered in “integrative medicine” programs in most academic medical center in the US, including some of the most prestigious, like the Memorial Sloan-Kettering Cancer Center, M.D. Anderson Cancer Center, Stanford University, and many more. It’s also offered in most large private health systems as well. Currently, 45 states plus the District of Columbia license acupuncturists, and, as Jann Bellamy noted last week, in their quest for licensure in all 50 states, acupuncturists scored a victory in Kansas, winning licensure with a very broad scope of practice. According to the National Certification Commission for Acupuncture and Oriental Medicine (NCCAOM), in California alone, there are over 10,000 licensed acupuncturists, and a total of nearly 28,000 licensed acupuncturists in the US, although the number of active diplomates is considerably lower. While FSM is correct that acupuncture is often included with a slate of other pseudoscientific medical interventions, it is still the one form of quackery accepted as potentially plausible by most doctors (or perhaps as least implausible). Perhaps it’s because it involves sticking actual needles into the body, but for whatever reason, there appears to be the least resistance to acupuncture and any medical center, academic or private, that has an integrative medicine program almost certainly offers acupuncture. For that reason there is a lot of interest in studying acupuncture, which will inevitably lead to more dubious studies, particularly because the physical act of inserting needles allows for all sorts of questionable hypotheses explaining how acupuncture “works,” facilitating its “integration” into quackademic medicine. Indeed, studies like the one I deconstructed in this post are part and parcel of the “evidence base” for acupuncture, as FSM has noted in its magnificently thorough discussion of acupuncture. Unfortunately, acupuncture is now so well-entrenched in “integrative medicine” programs that it will be incredibly difficult to dislodge.